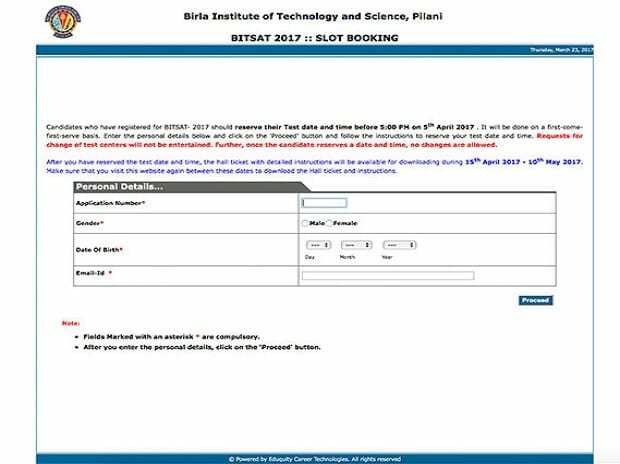 The Birla Institute of Technology and Science (BITS) Pilani announced that it has started the slot booking process for BITSAT 2017. Interested candidates can book the slots for the entrance test, date and time, from the official BITS Pilani website. According to the official website, candidates who have registered for BITSAT- 2017 should reserve their test date and time by April 5, 2017 and before 5:00 PM. It will be done on a first-come-first-serve basis. BITSAT-2017 is a computer-based online test for admissions to all the Integrated First Degree Programmes of BITS Pilani, at Pilani campus, Goa campus, and Hyderabad Campus for the academic year 2017-18. It is important to note that the reservations will be done on a first-come-first-serve basis. Candidates have to carefully enter the personal details and follow the instructions to reserve your test date and time. Once the slots have been booked and the date and time has been set, candidates cannot request any changes. * Enter your application number, gender, date of birth and email ID. The institute has also notified that the hall ticket will only be available from April 15 to May 10, 2017. The hall tickets will contain detailed instructions along with the test date and time and can be downloaded from the website during the above mentioned period. Candidates interested in admission to all the programmes, except B.Pharm, should have passed the 12th examination of 10+2 system from a recognised Central or State board or its equivalent with Physics, Chemistry, and Mathematics and adequate proficiency in English. For admission to B.Pharm, candidates should have passed the 12th examination of 10+2 system from a recognised Central or State board or its equivalent with Physics, Chemistry, and Biology and adequate proficiency in English. However, candidates with PCM may also apply for Pharmacy program. Only students who are appearing for 12th examination in 2017 or who have passed 12th Examination in 2016 are eligible to appear in the BITSAT-2017 test. If a candidate has taken more than one attempt in 12th class or its equivalent, only his latest performance is considered, provided this attempt has been for the full component of subjects/courses prescribed. Students who have passed 12th examination in 2015 or earlier are not eligible to appear in BITSAT-2017. Students who are presently studying in BITS at any of its campuses are not eligible to appear in BITSAT-2017. Admissions will be made purely on merit. The merit position of the candidate for admission will be based on the score obtained by the candidate in the BITSAT-2017. However, their eligibility for admission is subject to fulfilling the requirement of minimum marks in 12th examination. Institute offers guaranteed admission to all the students who obtained first ranks in their respective board examinations. So, first rank students of all the central and state boards in India for the year 2017 will be given direct admission to the program of their choice, irrespective of their BITSAT-2017. Candidate can choose the centre, the day and time of his/her convenience to take the test, as described in the later sections. BITSAT-2017 tests are scheduled during the period May 16 to 30, 2017. Some of the test centres may operate only for a limited duration during this period depending on the number of applications received. The final list of the centres will be announced at BITS admission website after all the applications are received. Each day the exam will be conducted in two slots. The first slot will be from 9:00 AM till 12:00 PM and the second slot will be from 2:00 PM till 5:00 PM. There is no time limit for individual parts of the test. The candidate can go back and change any of his/her answers among the 150 questions. If a candidate answers all the 150 questions (without skipping any question), the candidate will have an option of attempting 12 (twelve) extra questions, if there is still time left. BITS Pilani is an all India Institution declared as Deemed to be University under Section 3 of the UGC Act. M.Sc. : Biological Sciences, Chemistry, Economics, Mathematics, Physics and General Studies.